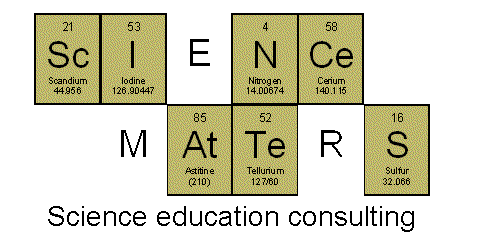 Each year, aAfter my students had learned about atomic structure and were beginning their periodic table investigation, they each chose an element to research a bit. Every year I varied the product they produced a bit - variations on the element models and an element block (watch for more information on that one coming soon). One year, in addition to making their block, I had them create a sticker picture of their element. 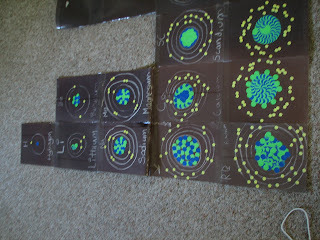 Each student was given a piece of black paper, blue dot stickers for protons, green dot stickers for neutrons, tiny smiley face stickers for electrons and a white colored pencil. 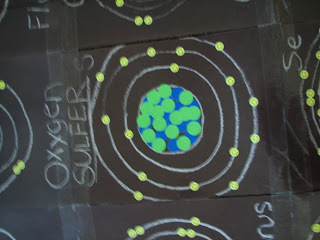 Making the picture was not particularly challenging - though some interesting questions did arise about electron orbitals for students who were doing transition metals. The reason for making the picture wasn't in the interest of challenging the students, but instead to create a giant periodic table. I laminated each of the individual pictures and then assembled them using clear packing tape. This periodic table does a nice job of showing the enlarging nuclei and increasing electron orbitals. 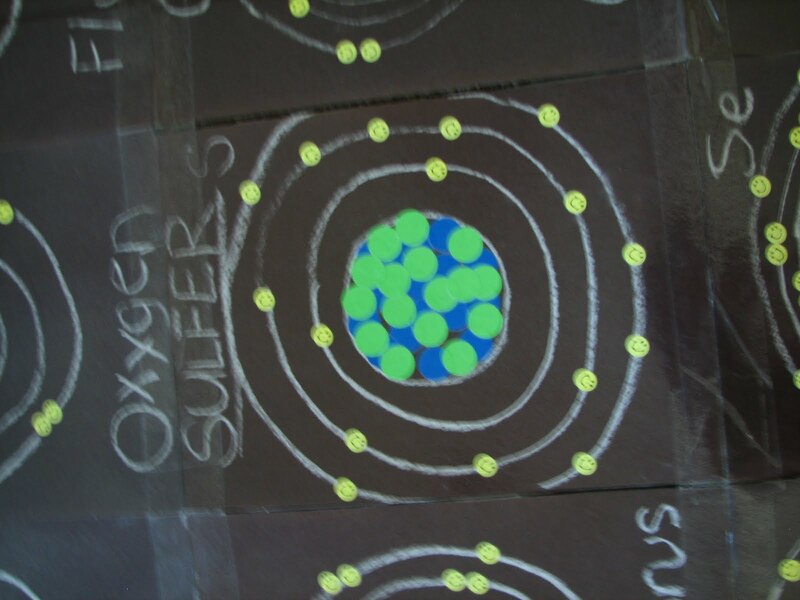 And by taking part in making the table, the students were much more invested in the process and obtained greater understanding of how their element fit in the periodic table. I had three classes of students and each student had to choose a unique element. Each class was informed of the parameters during class time and element choosing "opened" at the end of the school day - so each student had equal opportunity to have the first choice. 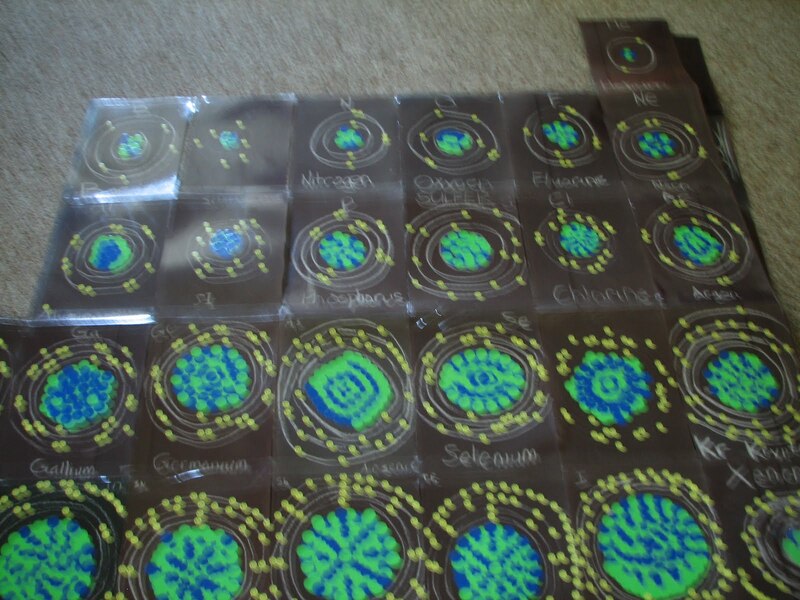 In addition, I had a few students who helped make pictures for some of the elements that weren't chosen, so we had a more complete periodic table - at least for the first several periods. What a great idea! I love that its on black paper, with white pencil, it just seems better that way you know? I really think this will be a nice visual and reinforcement for how the elements change as you move through the table. For our visual learners (and kinesthetic for that matter) will really remember this! Any suggestions on how many sticker packs to buy? Always quick work with extraordinary results. I've needed to come here for many last minute individual and work ventures and each experience has been excellent. Most of the students of the chemistry are so much confuse that how to learn the periodic table. You can get the wonderful method from https://www.accountingassignmenthelp.net/recording-transactions-and-adjusting-entries/ and learn that how to get the proper way to keep the table in your mind with the simple steps. Oh wao my favorite in school and college days I used to stay about periodic table and atomic structure in chemistry.It was so interesting site https://www.accountingassignmenthelp.net/.Your post is really informative.So cool.